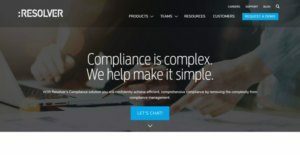 The compliance management software provides users with the capability to attain full visibility of their compliance program wherein they can visualize information, activities, and processes; and mitigate risk much better. The software delivers visualization tools that enable them to see their compliance requirements, tasks, controls, and control processes from a central location. Furthermore, Resolver can automate compliance management tasks and processes and equips them with alerts and reminders. Enable risk owners to effortlessly submit risk assessments and share data across the entire enterprise with software aligned to globally accepted risk management principles including ISO 31000, Basel and COSO ERM. With Resolver, you can produce meaningful board-ready reports, gain access to real-time dashboards, promote a risk culture through collaboration, and enable powerful automation. Maintain an efficient and comprehensive compliance program by ranking regulatory requirements based on the level of risk they pose to your organization, calculated using controls, impact, and the likelihood of occurrence. Resolver helps compliance teams by monitoring critical compliance developments, staying ahead of legal or regulatory issues and reducing infractions/penalties and other costs of non-compliance. Gain an integrated view of key risks to your organization and the related assurance activities needed to support efficient and effective assurance planning and coverage. Resolver’s Internal Audit application uses a risk-based approach to help you plan and manage audits more effectively, track issues ensure accountability and provide assurance across the organization’s most significant risks. Develop and maintain a system of internal control across your organization’s objectives, critical processes, financial reporting and major initiatives. Resolver’s configurable platform easily adapts to changing business needs and supports a risk-based approach to internal control to improve the efficiency of your SOX program and provide immediate visibility into testing efforts. If you are interested in Resolver it may also be beneficial to examine other subcategories of Best Compliance Management Software listed in our base of B2B software reviews. Since each enterprise has particular business requirements, it is advisable for them to desist from seeking a one-size-fits-all perfect software system. Needless to say, it would be useless to try to find such a system even among market-leading software platforms. The smart thing to do would be to catalog the various essential factors that need consideration such as key features, finances, skill levels of workers, company size etc. Then, you should do your homework thoroughly. Read some Resolver reviews and investigate each of the other apps in your shortlist in detail. Such exhaustive research can make certain you discard ill-fitting platforms and zero in on the app that provides all the features you require for business success. How Much Does Resolver Cost? Resolver’s SMB and enterprise pricing plan information is available only upon request. Please contact the vendor for details, and get your quote. We realize that when you make a decision to buy Compliance Management Software it’s important not only to see how experts evaluate it in their reviews, but also to find out if the real people and companies that buy it are actually satisfied with the product. That’s why we’ve created our behavior-based Customer Satisfaction Algorithm™ that gathers customer reviews, comments and Resolver reviews across a wide range of social media sites. The data is then presented in an easy to digest form showing how many people had positive and negative experience with Resolver. With that information at hand you should be equipped to make an informed buying decision that you won’t regret. What are Resolver pricing details? What integrations are available for Resolver? If you need more information about Resolver or you simply have a question let us know what you need and we’ll forward your request directly to the vendor.